Fresh, light and full of fabulous flavor, this curry is easy enough for everyday dinner and fancy enough for your most special dinner party. Whenever I say something is “my favorite”, she jumps in and, without the slightest hesitation, says, “No, that’s MY favorite!”. I feel a bit like Emmy when it comes to the seasons of the year. Each time a new one rolls around, I’m (emphatically) sure that it’s my favorite! Right now I’m quite smitten with the idea of fall and all the delightfulness it brings; cozy nights at home with family and friends, fires in the hearth, dancing leaves in a zillion hues of brilliance, cool, crisp morning walks, geese honking their way precisely south, sailing through vivid blue skies. And a plethora of delicious culinary specialties that, with the season change, nuzzle their way into our palette preferences. 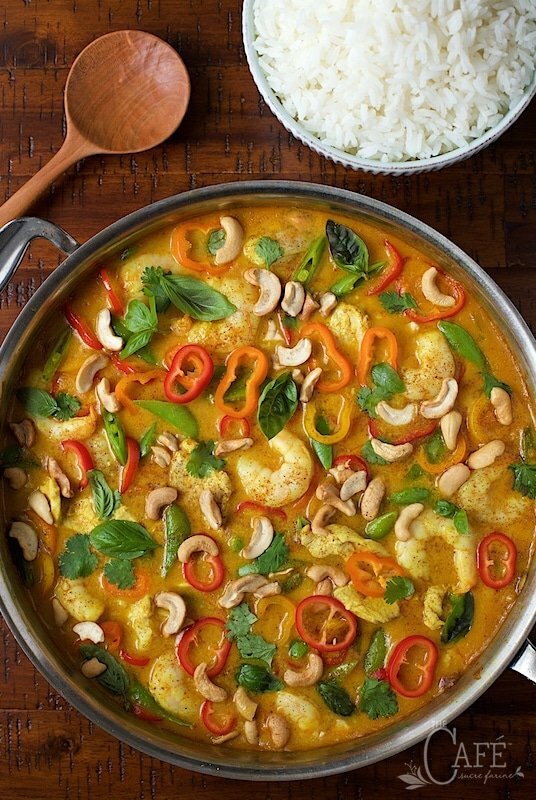 … there’s nothing like a little nip in the air to make us start craving the warm, spicy flavors of Thai cuisine. Pumpkins, apples, cinnamon, cloves, nutmeg, roasted meats, soups, stews, chilis and curries. Oh yes, and there’s nothing like a little nip in the air to make us start craving the warm, spicy flavors of Thai cuisine. It’s funny how certain foods are absolutely addictive; the more we eat them, the more we want them. 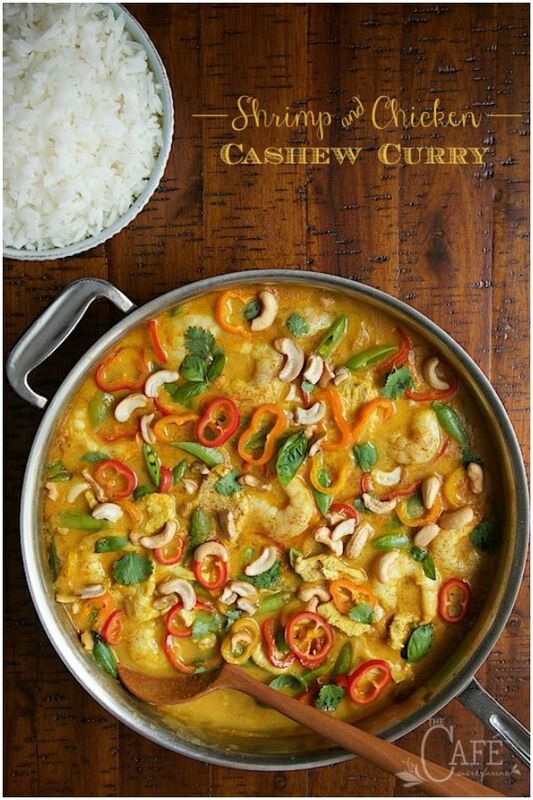 Curry falls into that category for us and I must say, it was to our benefit this past week as I tested and tweaked, made and re-made this Shrimp and Chicken Cashew Curry. Yup, we ate a lot of curries before I got the recipe just right, but it’s ready for you now and I think you’ll really enjoy it. Despite the fact that it looks fairly fancy, this recipe comes together in one pot, quite quickly. It starts with a couple spoonfuls of coconut oil and a sliced onion which is sautéed for just a few minutes till it begins to soften. Then comes all the (amazingly fragrant) good stuff; garlic, ginger, lemongrass, red curry paste, curry powder, turmeric, fish sauce and a touch of sugar. It all goes into the pan and cooks till your kitchen is filled with the most incredible aroma. Chicken (or vegetable) broth is added next and a slow simmer marries all the wonderful flavors together. We like our curries to have a bit of body, so I whisk together coconut milk and a few spoonfuls of cornstarch till smooth and creamy and slowly add this slurry to the simmering broth. Believe it or not, at this point, you’re just about done. You can keep going or just turn off the burner, add a cover and dinner is just 15 minutes away, whenever you decide to finish up! It makes a perfect entree for a dinner party as all the work is done long before guests arrive. If you’re making this ahead, just bring the sauce back to a simmer about 15 minutes before dinner time. Slip thinly sliced chicken and peeled shrimp into the bubbling broth and top with the peppers and pea pods. Return the sauce to a simmer for 1 minute then cover and turn off the burner. Don’t peek, it’s doing magic. But in ten minutes, remove the cover, scatter with a dusting of Garam Masala fresh herbs and cashews, and… voila! Dinner is served! A delicious dinner, bursting with bold flavor and loaded with amazingly tender chicken, perfectly cooked shrimp and crisp-tender veggies. A topping of toasted, salted cashews and fresh herbs adds yet another layer of deliciousness. 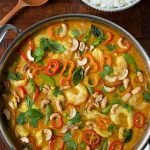 I like to keep bags of boneless chicken breasts and peeled, deveined shrimp in the freezer, making this curry super easy to put together, anytime! If you live inland, like we do, frozen shrimp is probably fresher than anything you can buy, as it’s usually frozen almost as soon as it’s caught. Shrimp can be thawed quickly, in a sieve under cool running water and, if you purchase chicken breasts shrink wrapped in individual servings, it takes less than 20 minutes to defrost the chicken in cold water. 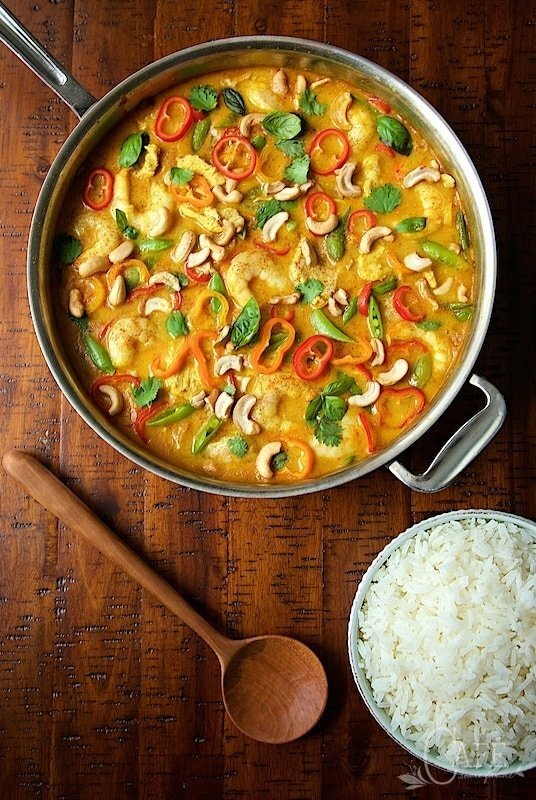 We love this Shrimp and Chicken Cashew Curry served in shallow bowls over Perfect Jasmine Rice. Leftovers are delightful and make wonderful lunches and quick meals on the run. So, when winter winds begin to blow and I’m spinning tales of giddiness over potential snow in the forecast, the delightful fragrance of citrus, hot cocoa on the back burner or the intoxicating aroma of cinnamon rolls wafting through my kitchen and I tell you winter is my favorite season, just laugh like I do about Emmy – but for now, celebrate this wonderful time of year and make a pan of Shrimp and Cashew Curry. You don’t have to tell a soul how easy it is – although they’ll be telling you how delicious it is! P.S. See my beautiful spoon? It’s part of a set that was gifted to me by Polder’s Old World Market, makers of gorgeous, handcrafted kitchen utensils. Polder’s Old World Market calls their utensils “dreamware”. I totally get it, it’s the stuff that cooks dreams are made of… Check out their site, these gourmet utensils would make such lovely gifts! Fresh, light and full of fabulous flavor, this curry is easy enough for every day dinner and fancy enough for your most special dinner party! Slice chicken breasts thinly, crosswise (about 1/4-inch slices). Cover with plastic wrap and set aside. If using frozen shrimp, place in a strainer and rinse with cold water. Set aside to thaw, occasionally rinsing again with cold water and draining. If using fresh shrimp, place shrimp in a strainer and rinse with cold water. Cover and set aside to drain while preparing sauce. Combine garlic, ginger, lemongrass, curry paste, fish sauce, curry powder, turmeric, sugar and salt in a small bowl. Set aside. Top, tail and peel the onion. Cut in half through top and stem ends and slice into thin wedges. Heat oil in large deep skillet, over medium heat until hot. Add onion to skillet; sauté 3-4 minutes or until translucent. Add garlic-spice mixture to onions and stir to combine. Cook for 1-2 minutes stirring continuously, or until very fragrant. Add the chicken broth and bring to a boil. Reduce to a simmer and cook for 15 minutes. Whisk together cornstarch and coconut milk till smooth. Add slowly to simmering broth mixture, stirring continuously. Continue simmering for 2-3 minutes until sauce has thickened. At this point, you can remove pot from heat and set aside until 15 minutes before serving time. Otherwise proceed with next step. Add chicken, one or two pieces at a time, distributing evenly into pan. Add shrimp in same fashion. Top with sliced peppers and sugar snap peas. Return mixture to a medium simmer and cook one minute (don't stir), then cover tightly and turn off heat. Allow to sit for 10 minutes then remove cover and serve over jasmine rice. Garnish with a dusting of Garam Masala and a scatter of the herbs and cashews. * Be sure to slice the chicken thinly, as it doesn't cook very long and if it's too thick it won't be done. If you have trouble slicing the chicken thin, just place the breasts in the freezer for about 15 minutes and then proceed with slicing. I really like the Kirkland boneless chicken breasts from Costco that are sold in a bag with each breast individually shrink-wrapped. I just pull out as many as I need and place them in a bowl of cold water. Within 20 minutes, they're thawed and ready. ** I like to keep a bag of the Costco large frozen shrimp in the freezer. You can take out just as many as you need, place them in a strainer and spray with cold water. 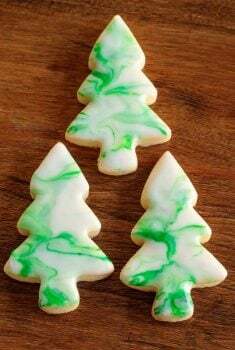 They defrost quickly and are ready to go! *** I like this brand of red curry paste. It's available at lots of larger grocers as well as online. We like our curry medium spicy so 2 tablespoons is just perfect. If you like more heat, you can add 3 tablespoons (or more, as desired). I would start with two, finish the curry and taste. If you like it spicier, you can always add more of the red curry paste at the end. You just can't take it away if it's too spicy. I am allergic to shrimp could I leave it out or add more chicken? It is so pretty and I do like curry. This is a wow dish, Chris! So hearty and full of flavor. It reminds me of some dishes of the region that I come from in Brazil. I am so sharing this! Without question one of the best curry recipes I’ve made. 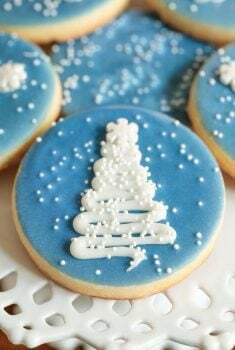 The recipe has been placed on my top favourites list! Chris, You were facebooking teasers on this curry when I left for my East Coast trip. I was worried about m,issing it (and, I did). Today I finally scrolled through your blog until, Bingo. This curry looks fabulous. And, by picking up 4 or 5 ingredients at Whole Foods, I will be able to put it together. The lemongrass, maybe not. It just so happens that I made a curry this week that I didn’t enjoy at all. I have a tried-and-true curry recipe but am looking for another. Perhaps this will become MY favorite curry. Emmy is a doll. This dish was absolutely delicious!!! My husband who hates curry – ate 3 plates and told me it was one of the best dishes I have ever made!!! 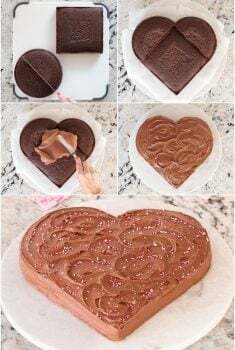 WONDERFUL RECIPE- THANK YOU!!! Lisa, that is so sweet! Thanks for commenting and sharing, it makes our day! Sounds like you’ve got a converted curry lover in your family now! It really grows on you! We live less than 10 minutes from the fishing fleet in Mooloolaba and can buy prawns right off the boat along with freshly caught fish. I think I need to dash over and make this curry! Maureen, now you’ve got me drooling! Fresh seafood! Is there anything better? Chris, what a colorful presentation! Love the combination and wide range of flavors that you employed in your recipe! The curry paste and the spices must add such a warm touch as well! A perfect recipe for this time of year – although the weather is quite sunny around here, the nights are rather cold! Our weather is just about to change too Andrea! Today’s high is ten degrees lower than yesterday’s! Fall is here! That is a dish I wouldn’t mind making over and over again! The warmth of the curry is perfect for this time of year and I like that you thickened the sauce a bit too. Your granddaughter is clever and adorable! Thanks for your lovely comments Susan! We are blessed with all five of our grands. Such different personalities, every one! I wish I had been one of your taste testers for this dish — the finished product looks like a work of art! Thanks Sue! We had a lot of opportunities to “test” this recipe. I think you could have called this “Curry Week” here at the Café! 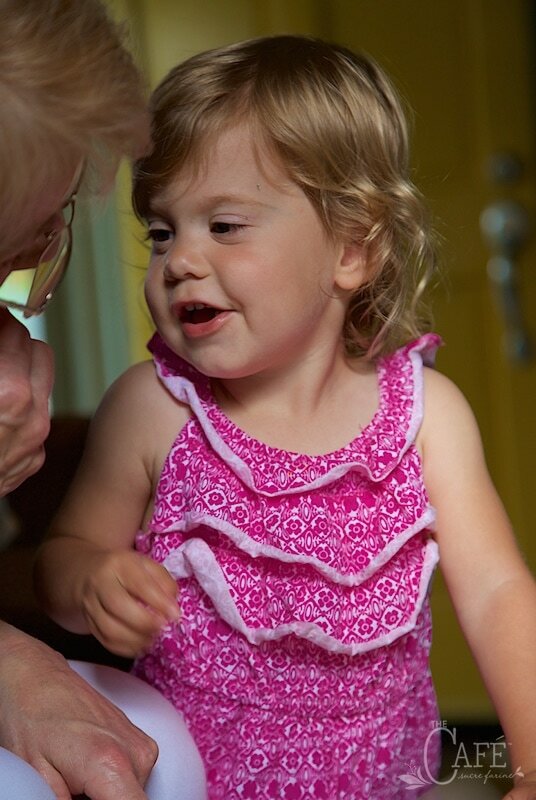 Your granddaughter is soooo sweet, I love her pretty dress too. Thanks for your lovely comments Adina! I love to dress up my dishes with things that are healthy and yet, colorful. 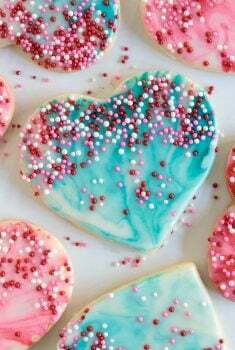 After all, we tend to eat first with our eyes and then our taste buds, don’t we? What a cutie!!! This “No, it is MY favorite…” is so funny …and cute as well. Children (and grandchildren) are God-sent presents to make our life complete and much happier. I just hope I live enough to meet mine and yes, spoil them. This curry has many of the ingredients of a Brazilian dish called ‘moqueca’ and they even look alike with the sliced peppers on top, accompanied by white rice. I first saw it on Facebook where you did post your husband picture shooting the dish. It looks super comforting and delicious! Thanks Denise! I’ll have to look that dish up, it sounds fascinating! It’s one of those dishes you could eat again and again! Thanks Jennifer! When Scott was looking through the lens of the camera, he kept saying, “I’ve got another one!” It was that photogenic! The nutrition tool I use does not have the option to add the number of servings or serving size. I used 8 servings to calculate the nutrition information. The recipe makes 6 large servings (about 1 3/4 cups) or 8 average size servings (about 1 1/4 cups). We tend to go with the large servings but we’re also quite crazy about curry. She is such a sweetie! 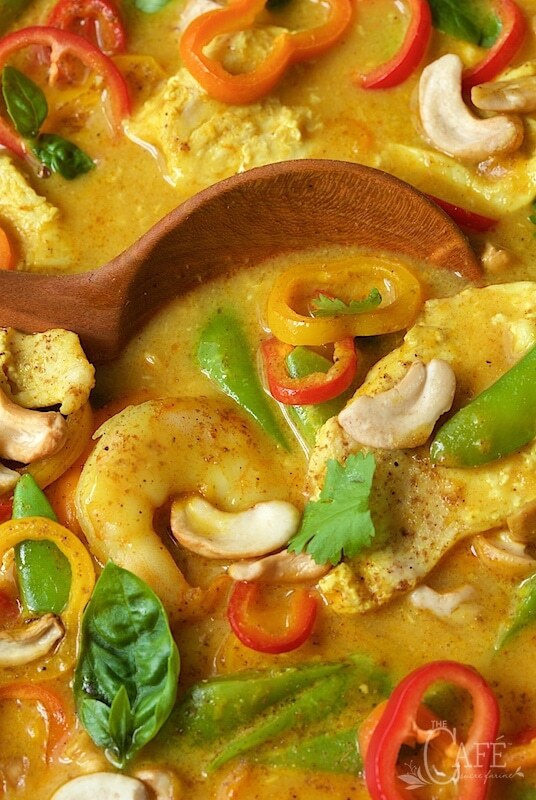 Shrimp, chicken and cashew…all my favourites.. the curry is absolutely droolworthy. It is Angie, even when we’ve had it four times in a row! Hee hee! Thanks Loran! We love your products, each one is so unique and so beautiful. Like ALL your grandchildren, Emmy is just a doll!!! And what a gorgeous, flavorful chicken curry! With all those fresh vegetables, it is just my style. Thanks Liz! She’s got a really sweet, funny personality too! I love curry and this looks absolutely mouthwatering! The mix of shrimp, chicken, and cashews is a personal favorite of mine. They really compliment each other, don’t they Laura? Hi Sara, why do you say that? This looks very good and thanks for the link to your fave sauce.I am visual.I know this brand..yay we have it! Thanks Monique! She’s a real sweetie too! This is such a beautiful dish Chris! The color is amazing – truly a thing of beauty. I bet it tastes pretty spectacular too – and I think it could be “my” new favorite 🙂 Your granddaughter is a doll! Thanks Tricia! It’s portable too! We took it over to our son’s house (Emmy’s dad and mom) that night, heated it slowly on the stovetop and it was delicious!